Getting hurt at work is stressful enough without adding the stress of applying for Workers' Compensation benefits. Workers' Compensation.com is dedicated to helping employees who suffer from work-related injuries or illnesses get the benefits that they deserve. We've compiled resources to help educate you on the general Workers' Compensation process in order to make your application as fast, easy and successful as possible. We will also be adding more resources in the near future. Please continue to visit this page for the latest updates. Back Injuries - often occurring from repetitive lifting, bending and standing. Shoulder Injuries - injuries similar to torn rotator cuffs from physical stress. Knee Injuries - due to repetitive stress. - chronic neurological pain due to injury. Head and Brain Injuries - possibly resulting from falls or traffic accidents. Pulmonary & Respiratory Injuries - resulting from toxic exposures. Infections - occurring as a result of a work-related injury. Our skilled Workers' Compensation attorneys can handle claims for these as well as many other types of injuries. They are also skilled in the more complex cases of aggravation or exacerbation of preexisting conditions. If you were injured on the job, it is important that you have an experienced attorney review your claim. For a FREE claim evaluation, click here now. The following links will provide additional in-depth resources about Workers' Compensation benefits, as it is impossible for our site to delve into all of the complex issues. When following these links, you will be exiting the Workers' Compensation.com server. Workers' Compensation does not endorse, or take responsibility for the linked organizations and the information contained on their sites. We hope you find these resources useful and will return to Workers' Compensation.com soon. Thank you for visiting our site. http://www.dol.gov/esa/owcp/ - The Office of Workers Compensation Programs (OWCP) is part of the US Department of Labor and administers disability compensation programs for workers who experience work-related injuries or illnesses. http://www.dol.gov/esa/owcp/dfec/index.htm - The Division of Federal Employees' Compensation (DFEC) operates 12 offices nationwide that administrate the Federal Employees' Compensation Act that provides for Federal and Postal workers around the world. 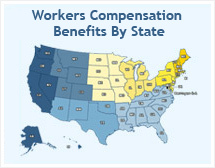 http://www.workerscompensation.com/workers_compensation_for_employees.php - A website for both employers and employees, that includes a popular injured-worker forum and state-specific rules and forms. http://employment-law.freeadvice.com/workers_comp/ - A resource website with advice on many legal topics. This section covers FAQ's for the benefit process, injuries and the need for an attorney. http://www.osha.gov/as/opa/worker/index.html The Occupational Safety and Health Administration provide information on workers' rights and how to file a claim regarding dangerous working conditions.